What would you do if you were challenged to defend your life and honour in a sword fight–that you couldn’t refuse? You’d have to get a crash course from your local fencing master, of course! 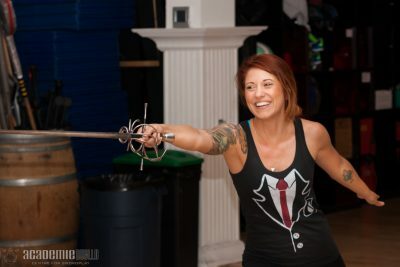 Join the expert sword instructors of Academie Duello for an adventure in the art of the Duel. You’ll follow in the footsteps of the many 17th century nobles that found themselves in this same predicament by learning the art of swordplay in a fun and fast-paced learning experience. To handle and explore dueling swords in our Arms and Armour museum. Authentic swordplay knowledge from a 17th century martial arts tradition. This experience ties together history and authentic swordplay into a fun adventure you can experience on your own or with a group of friends or family. To purchase a gift certificate for this Adventure click here. The 14th century knight was a formidable warrior versed in the arts of the sword, spear, lance, shield, axe, and unarmed. A master of battle. Join us for a 90-minute immersion in the history, skills, and training of the medieval knight. From grappling, to two-handed swords, to pole-axes, and back again. You’ll get to try on armour, get a private tour of our historical arms and armour museum, and have a lesson in the rich and powerful martial art of Northern Italy: Armizare. To try on a knight’s armour and explore knightly weapons in our Arms and Armour museum. 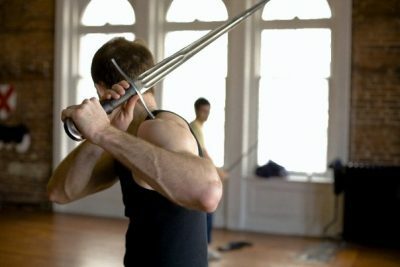 A lesson on the battlefield martial art of Armizare, including: The foundation of martial movement and posture; use and defence with the dagger, two-handed longsword, and the poleaxe; fighting strategy and tactics. Authentic swordplay knowledge from a 14th century martial arts tradition. A chance to bring the art together in a choreographed sword encounter. This experience ties together history and authentic knightly martial arts into a fun adventure you can experience on your own or with a group of friends or family. We provide expert guidance, practice weapons (specialized blunt steel swords), protective equipment, and a safe and engaging environment for adults of any physical ability. Get on a horse, take up a sword, and ride to glory! This two hour program, hosted at our partner stables in Langley BC, will introduce you to the foundations of riding, horsemanship, and swordplay. You don’t need any prior experience and even the most timid adventurers will discover the excitement of knighthood. How to wield and move gracefully with the medieval two-handed longsword. Core attacks and defenses with the blade. The basics of strategy to defeat your opponent and stay alive. Working with and around war horses. Mounting and building riding comfort. If you and your group have prior riding experience, please contact us to arrange for a more advanced riding program. Facing the quintain, a medieval sword and shield dummy that will test your power and speed. Spearing rings, to build your accuracy and precision with the sword’s point. Cutting targets, to challenge your coordination and equestrian skills. We provide all of the specialized equipment needed for mounted combat, such as swords and protective gear. All you need to bring is heeled boots, comfortable clothes, a pair of gloves, and a sense of adventure! This theme is available for private bookings of 1 – 8 people. Customized programs are available for larger groups by combining elements of our non-equestrian offerings and themes. From the depths of Sherwood Forest to the fields of Agincourt, prepare yourself to take up the mantle of “Archer”! Take a crash course in the history of this ancient weapon, and the skills required to wield it. This session is ideal for people who would like to experience a glimpse of the archer’s elegant martial art. We provide students with bows, arrows, and expert coaching. This adventure takes place in a safe and welcoming environment and is suitable for beginners at any fitness level. 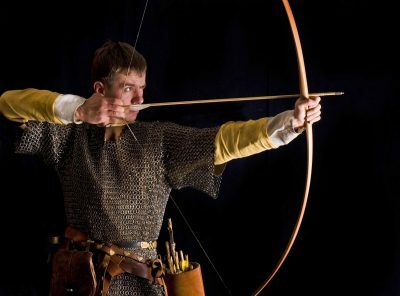 The (brief) history and origins of archery from all over the world. The principles that enable safe and healthy shooting. The basics of stance and drawing order. The parts of bows and arrows. This theme is available for private bookings of 1 – 12 people. Customized programs are available for larger groups by combining elements of our non-equestrian offerings and themes. If you would like an exclusive session on your own or with a group of companions, visit our Private Adventures page. All of these themes are available, plus more! All our sessions take place at the Academie Duello Centre for Swordplay, located at 412 West Hastings Street in Vancouver BC, except for our horseplay sessions which take place at Cornwall Ridge Farms, located at 21955 16th Ave in Langley BC. If you have any additional questions you can call us at 604-568-9907 or email bookings@academieduello.com.